Expertise and instrumentation to explore stable isotope distributions in soil and aquatic environments. The SoWa Stable Isotope Facility is located in České Budějovice, Czechia within the framework of the Soil & Water Research Infrastructure, Biology Center, Czech Academy of Sciences. We are primarily a collaborative service facility that aims to enable and develop stable isotope applications and to answer congruent research questions. We support interdisciplinary investigations of soil and aquatic habitats by offering scientific consultation, student training, and a broad range of instrumentation and approaches for determining stable isotopic ratios of carbon, nitrogen, sulfur, oxygen, and hydrogen. Our commitment is to scientific merit and publication of the stable isotope ratio measurements generated by our combined thought, time, resources, and facilities. The SoWa Stable Isotope Facility is equipped with a Thermo ScientificTM 253 PlusTM 10 kV IRMS configured for the for determining the stable isotopic ratios of C, N, S, O, and H introduced as CO2, N2, SO2, O2, H2, CO, N2O, or CH4 via continuous flow from the peripheral instruments listed below. SmartEA Isolink (Thermo ScientificTM) converts solid and liquid samples to CO2, N2, SO2, H2, and/or CO gases via flash combustion and, in a single injection, allows for determination of δ 13C, δ 15N, δ34S in samples with C:S ratios up to 103. Trace GC 1310 Isolink II with Conflo-IV and tandem ISQ (Thermo ScientificTM) for separation of ≥C1 gases and combustion/pyrolysis for determination of stable isotopic composition. Analytes may also be channeled to the ISQ for simultaneous generation of MS2 spectra to support compound identification. The GC injection ports are equipped with both standard and PTV injectors as well as a double-shot pyrolyzer. GasBench II (Thermo ScientificTM) with cold trap allows for pre-concentration, purification, and separation of CO2, N2, SO2, O2, H2, CO, N2O, and CH4 introduced via autosampler injection of headspace samples as well as direct injection onto sample loops (10-100µL). LC IsoLink for separation and conversion of organic compounds to CO2 for IRMS analysis. 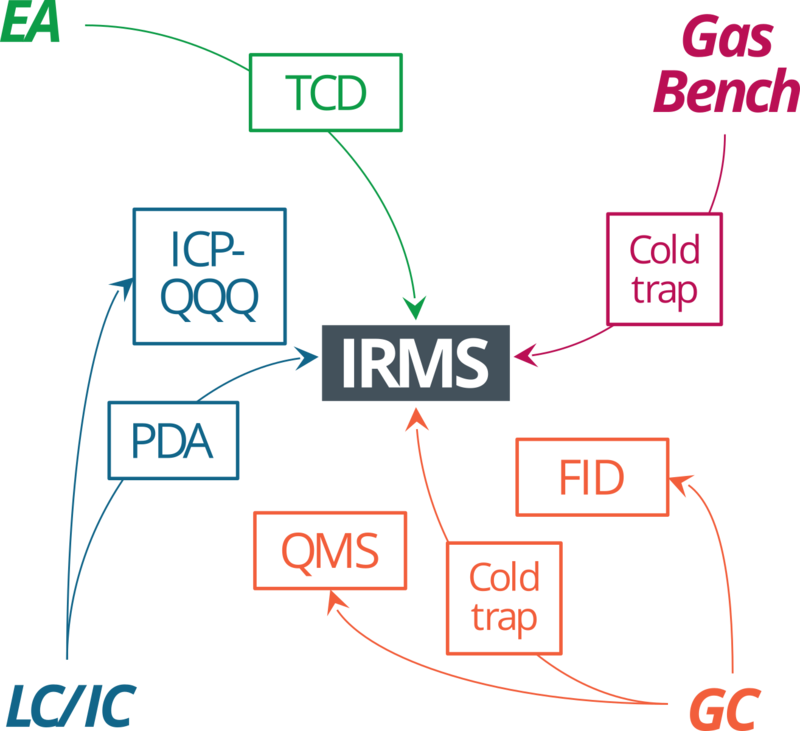 The LC flow may be split to an ICPMS/MS detector, allowing for simultaneous analysis of stable isotopic and metal compositions. LC column chromatography allows separation of targeted compound groups (i.e., mono- and oligo-saccharides, sugar alcohols, amino acids and organic acids) as well as non-targeted mixtures of complex natural substances with molecular weights ranging up to 1000 kDa.